Pin now, practice later! How to improve your forward fold. Join the discussion on the YBC Yoga Forum! Wearing: Teeki pants, opi nail polish, midi ring from Greece (similar). Using: Mat. If you're working with super tight hamstrings, I would suggest just staying with number one and not moving on to the other two, because the others are really only suitable for when your legs are straight. Pin now, practice later! Tips for improving your forward fold. 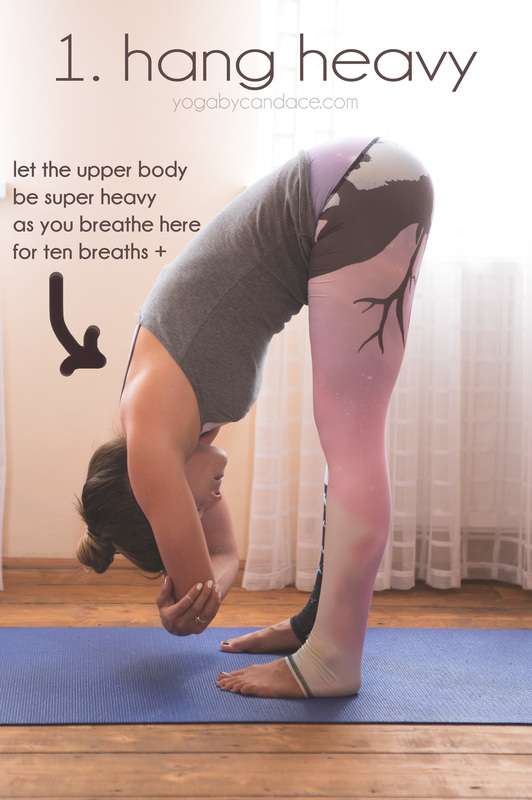 This is for my beginners, my people with really tight hamstrings who are working with bent legs and currently are unable to straighten them. Ain't no shame in the bent leg game, people! Let your whole upper body hang heavy over the legs. Bend the legs if you need to, but keep actively breathing in the backs of the legs and intending to straighten the hamstrings. Once you are able to straighten the legs, play with aligning the hip joints over the ankles by rocking back and forth gently on the feet. This gets a bit deeper into the hamstrings and sets you up for a by-the-book forward fold. Pin now, practice later. 3 ways to improve your forward fold. One of the best tips I can give, particularly to those who have hypermobility in the knee joints and are hyperextending the legs is to lift the kneecaps. When you do this, the leg muscles engage, thus preventing an injury in the hamstring or to the knee joints from hyperextension. Let's talk What tips do you have for forward fold? How is your forward fold? A pose you love or loathe or somewhere in between? Let's share Share a picture of your forward fold on instagram or twitter with the hashtag #yogabycandace.